At 8:16am CT this morning, a large explosion shook a three-story building in Minneapolis. The structure was quickly engulfed by fire, and some of the apartment-dwellers on the upper floors were forced to jump from their windows into subzero temperatures to escape the blaze. The top floors of the building eventually collapsed into the first floor. Fourteen people were hospitalized, and six of them are listed in critical condition. The explosion occurred at 514 Cedar Avenue South in Minneapolis, in the Cedar-Riverside neighborhood at the western edge of the campus of the University of Minnesota, just across the river from the main campus and adjacent to the Bohemian flats area. A news article refers to the locale as an “ethnic community of predominantly Somali immigrants”. I’m told that the neighborhood is also known to law enforcement and intelligence officials as a place where Islamic terrorists congregate. In one news story the building was described as a “community center” containing a grocery, a mosque, and apartments. Other reports said the mosque was “nearby”. 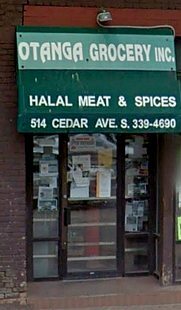 The store on the corner is (or was) the “Otanga Grocery — Halal Meat & Spices”. 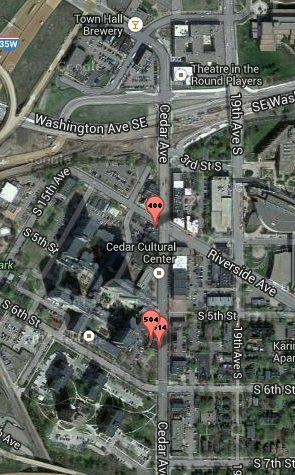 The proximity of a mosque to the incendiary event made my spider-sense tingle, so I took a quick look around the region, using Islamic Finder to check out the mosques and Islamic businesses in or near the 55454 zip code. There were a number of mosques and community centers, a variety of of businesses — including the Otanga Grocery, a.k.a. the “Cedar Halal Market” — several Islamic societies, a collection of doctors, and a construction firm. A block or so north of the grocery is the “Masjid Shaafici” at 400 Cedar Avenue South. 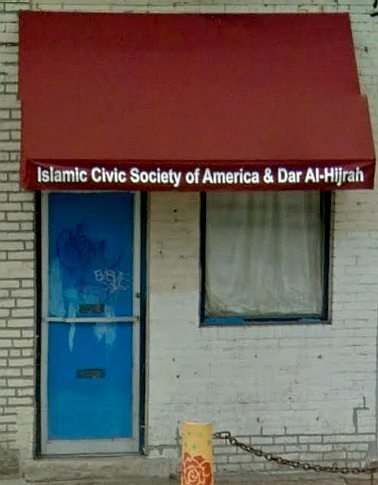 But the mosque described in the news story seemed almost certain to be the “Islamic Civic Society of America and Dar Al-Hijrah Mosque” at 504 Cedar Avenue South, the building immediately to the north of the one where the explosion occurred. For some reason Google Maps puts the mosque behind the building at #514, but it is actually next door. Out of bloggerly curiosity, I took a look at the website of the Dar Al-Hijrah Mosque. Among the resources on their links page are Prof. Tariq Ramadan, Dr. Yusuf Al-Qardawi, Ottawa Muslim, the Islamic Circle of North America (ICNA), the Islamic Society of North America (ISNA), the Muslim American Society (MAS), The Muslim Brotherhood, the Islah Movement in Somalia, the Muslim Association of Britain, the Council on American-Islamic Relations (CAIR), and other Muslim Brotherhood fronts. Some of the news reports published this morning said that all the building’s occupants had been accounted for, and no deaths had been reported. However, according to a more recent article, three people are still missing. Minneapolis Fire Chief John Fruetel told the press that the cause of the explosion is still unknown, and is under investigation. As far as I could determine, no news story or fire department statement mentioned the possibility of a gas leak. It may be quite a while before we find out the cause of the fire, if indeed we ever do. Therefore the rest of this post is pure speculation. Zuhur Ahmed, a board member of the Minnesota chapter of the Council on American-Islamic Relations, said the group was monitoring the situation closely. But then, CAIR always believes that the best defense is a good offense. If it were a gas explosion, the normal process would be for gas to accumulate inside the building until a chance ignition detonated it. Under those circumstances, the walls of the building would be blown outwards, causing a sudden, catastrophic collapse of the structure and filling the street and surrounding lots with bricks and rubble. Nothing of the sort occurred. The earliest photos show an intense and rapidly-spreading fire that looks like it originated on the second floor, immediately above the grocery. This would be consistent with the unexpected detonation of an explosive substance — say, ammonium nitrate, just to pick a random example — which then distributed very flammable material within an enclosed space, creating a flash-fire. If this was the case, did they escape out the back before the firemen and the police arrived? Or are their charred corpses buried somewhere in the rubble — shahids before their time? If the FBI, ATF, or DHS turn up at the scene, we’ll know something’s going on. But we may never hear any details. This entry was posted in Counterjihad, Domestic terrorism, Enrichment, News, USA by Baron Bodissey. Bookmark the permalink. Ah Islam! Another day another reminder! Quote from one link: CenterPoint Energy spokeswoman Becca Virden said there were no natural gas leaks in the area. 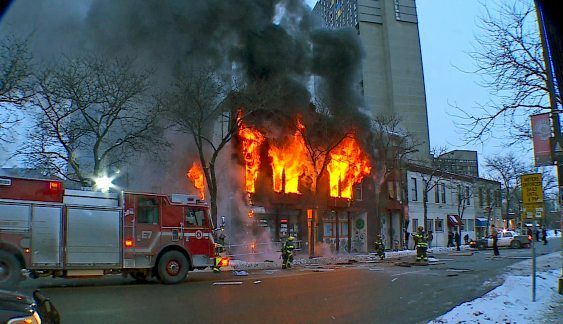 Most of the injuries were from burns and the “trauma of people that came out through the windows,” said Robert Ball, a spokesman for Hennepin County Emergency Medical Services. Officials don’t know whether people jumped out, fell or were pushed out by the explosion. KARE11 video report @ 3 minute mark suggests the ‘slightly damaged’ mosque wraps around and goes around the collapsed building. Thank you for this excellent update! This seems to support my speculation so far. If you discover anything that contradicts what I said, don’t hesitate to leave it in a comment. I’ll post it. Good point about the “explosion” regarding a gas leak. With gas its not so much an explosion as a quick conflagration as the gas burns outward from its source of ignition. Interestingly, since its a pressure build up from the hot combustion and not a shock front like a pipe bomb would be, the windows wont always blow, but a wall may give first. I’ve been waiting for the Somalis to start their typical behaviour patterns. A mosque and cultural center stands between the grocery, the Islamic Civic Society of America & Dar Al-Hijrah, and Palmers Bar. If anything I am inclined towards the presence of TATP (a.k.a. Mother of Satan), probably in its trimeric form, at least as the initiator. Whilst highly sensitive it is relatively simple to produce using acetone and hydrogen peroxide and during the sublimation stage when it is crystallising it is normal practice to disperse it on a drying medium. Small quantities of less than about 5 grams, if not contained, will burn fiercely but any greater quantities, or if contained in any way, or completely dry will explode at the slightest amount of heat/shock/pressure; obviously in the wrong circumstances (or the right ones, depending upon one’s point of view) both burning and detonation can take place rather rapidly in that order. Furthermore, any hydrogen peroxide (H2O2) present in the vicinity of high temperatures will thereafter give off large volumes of oxygen to feed the subsequent conflagration. It was TATP backpack bombs that the enrichers used on the London Underground on 7/7, but it is interesting to note that the second, later attack failed because these retards had tried to stabilise their TATP with chapatti flour and overcooked it, so to speak. Personally I wouldn’t attempt to make this stuff in a properly equipped laboratory never mind in a bathtub in Beeston but there’s no accounting for the Jihadi mind set. 1. After several hours of thousands of gallons of water being pumped in, the roof collapsing, the original conflagration being visibly extinguished and much of the building turning into a block of ice another fierce fire breaks out in one corner of the domestic top floor giving off dense black smoke? Well, whilst many materials such as plastics and petroleum products give off black smoke during thermal decomposition, so do many flammable liquids. Acetone, for one, is highly flammable and can be chemically extracted from such common products as nail polish remover, boot polish, paint thinner etc. etc. 2. As far as the investigation goes it is going to be virtually impossible to carry it out in any forensic detail as long as the ice remains. It is therefore likely to take one hell of a long time before the exact cause can be determined, if at all, and this will be to the advantage of any, if any, involved in illegal activities and, more significantly, anyone who for politically correct reasons might like to see attribution to certain sub-culture, if that should turn out to be the case, well and truly buried. “Omar Hassan approached police Inspector Medaria Arradondo after the news conference. His friend Ahmed Farah Ali lived in the building and hasn’t been found. Neither Ali nor his roommate was answering their cellphone. His uncle in Connecticut hadn’t heard from him, and he wasn’t at Hennepin County Medical Center, where some victims were taken, Hassan said. A video clip following this is of interest . . .
link FWIW, the Somali language sure sounds a lot like Arabic (CIA World Factbook lists following languages of Somalia: Somali (official), Arabic (official, according to the Transitional Federal Charter), Italian, English). The FBI et. al. will find out it was bomb making stuff that went up in smoke and the Obama admin will squelch any release of such information. Count on it. Possible government censorship is not out of the question as to what really occurred. Remember that recent post on JW about a pair of gunmen who attacked a power station in CA on the same day as the Boston Bombing and we only heard about it a week ago and even then from a British newspaper? It’s clear the the authorities do not hesitate to order the MSM not to report on certain events. This had really serious implications in the event of wide spread attacks in the U.S. All we’ll notice is perhaps the power going out and no tap water and perhaps some news report about a planned power outage or some sort of MSM bilge. There were a LOT of train derailments and bus crashes after 911 – but no one ever connected the dots there either…. And what to say about some commenters? Always great when people are smarter than reporters and local police. I agree with Gates of Vienna: the truth will be suppressed. Gas leak will be confirmed. Department of Homeland Security was on scene, according to an article from Minneapolis star tribune. That location was already on their radar I’m sure. Minneapolus FD Chief seems to be pushing gas leak as a cause w/o any real investigation, and even with official from gas Co saying no gas leak! Why so quick Chief? God forbid they hint at anything terrorist related, don’t want to hurt the Muslims feelings.